Hey guys, I'm Felicia. I know Angie stopped by last month to give you a peek into her new life out at the farmhouse. I'm just as happy to be in the apartment over the County Seat. It's our restaurant, or will be in about three weeks. Right now, it's a work in progress. Angie and I met during culinary school and did a really stupid thing. Well, actually two. We opened a restaurant, el pescado, in the outskirts of San Francisco together. Then the second thing? We asked Todd to be part of the team. Of course, he woo'd Angie. Mostly so he wouldn't have to do any of the work. I could see the guy was a user from day one. But that's all water under the bridge. We closed down last year when our lease was up and we couldn't afford the new rent payment. Todd went back to New Jersey, and Angie and I moved here to River Vista, Idaho. Where Angie's all about the garden and her new pets. I have a different life style. Not big city. I think River Vista has about 600 people inside the city limits. But I have everything I need. There's a yoga class on Friday's down at the Methodist church. And just down the block, there's a country western dive bar that I can walk to and from with no issues. I've met a lot of new friends here and they're always dragging me to one festival or another, but Angie, well, she's more of a home body, even if it is just her and that adorable dog she bought a couple of months ago. I have to say, I love Dom as much as she does. Anyway, the plumbers are here to finish installing the sink and dishwasher down in the kitchen so I better go let them in. I hope to see you around River Vista, or if you want a good meal, stop by the County Seat. I promise, you won't be disappointed. 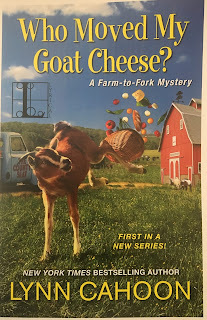 To celebrate next week's release of WHO MOVED MY GOAT CHEESE, I'm giving away a digital copy of the book. Leave a comment with your email address about your favorite food and the random gods will chose a winner on Sunday, March 4th. I do enjoy pulled pork. Very tasty and do not forget the potato chips. There is a fabulous goat farm in Maine (Seal Cove Farm, http://www.mainegoatcheese.com/) that make delicious cheeses and in the summer has a wood fired pizza oven. The pizzas have all their ingredients grown right there. Just about the best pizza ever! Winner!!! The random gods have chosen you. I've sent your prize to your email address. My favorite food is a good rib eye steak. Thank you for the opportunity! 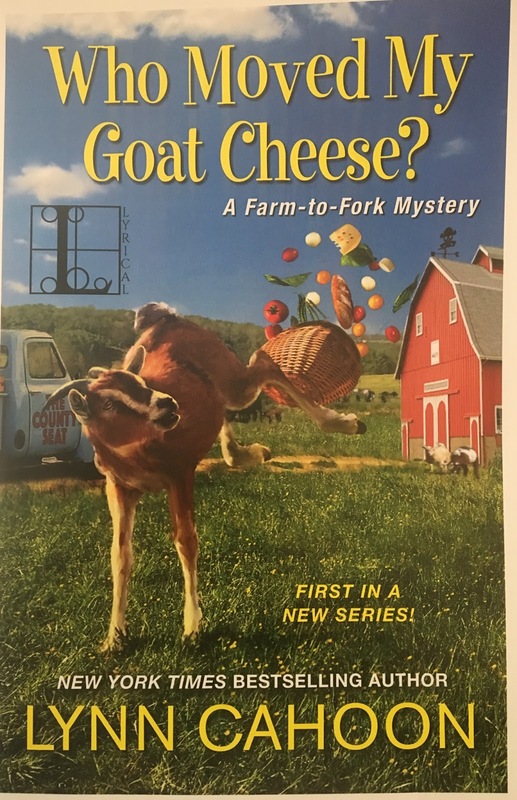 I can’t wait to read Who Moved My Goat Cheese?. The title and cover bring a smile. The story is sure to entertain. Choosing one food... cheese ravioli. Of course I’ll need to add meatballs, tomato sauce, and garlic bread! Well, my favorite food is chicken and dumplings!! Of course I’ll need to add meatballs, tomato sauce, and garlic bread!